Hours of Operation: 9:00 AM. to 9:00 PM. The 4th of July is coming up. Please enjoy your time in the outdoors but use caution. You are responsible for fires you start. Let’s celebrate our freedom without starting new wildfires. Due to recent rains, there is a small stream flood advisory for Fairbanks. This advisory is not likely to impact the Delta area significantly, but always use extreme caution when enjoying the great outdoors. 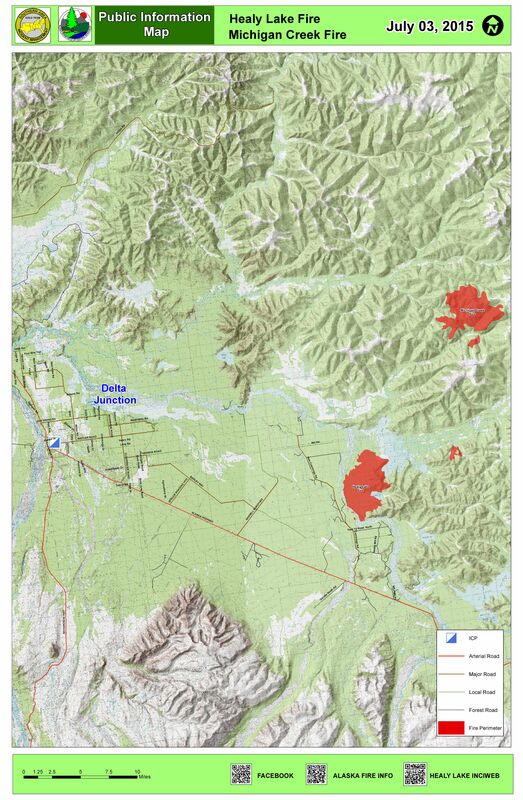 The Michigan Creek Fire started on June 17, approximately 38 miles northeast of Delta Junction, Alaska. This fire is estimated at approximately 9,601 acres and at 0% containment. We are preparing long-term fire management strategy that will identify appropriate responses to fire activity as it develops. Recent rain has reduced fire activity significantly. Healy Lake Fire – Crews continue point protection around structures and numerous other values at risk. Mop up of spot fires on the west side of the Tanana River continued, a no-hotspot criteria is being used. Back hauling of excess supplies and used materials continues. Development of rehabilitation needs has begun. Michigan Creek Fire – We will continue to monitor by air. Wednesday’s 1.5 inch and yesterday’s .25 inch rainfall has led to a flood advisory from the National Weather Service. Yesterday’s temperature reached the low 50s with winds out of the west at 10 mph with gusts to 14 mph. A drying period is likely over the July 4th weekend with increased temperatures and decreased relative humidity. There are 2 light helicopters currently assigned to this incident; plus 1 medium helicopter is based here and available, unless needed for initial attack of a new fire or other higher priority use. Healy Lake aircraft will support new fires in the Delta response area should they be requested. Other resources: 1 Type 1 Crew, 2 Type 2 Crews, 13 Boats, and 2 Water Tenders. A temporary flight restriction (TFR) is in effect over the Healy Lake Fire. The Burn Ban has been lifted for most of Alaska, including the Delta Area. The burn closure is still in effect in Southwest Alaska and the Municipality of Anchorage. For more information regarding restrictions, visit http://www.akfireinfo.com.